UPSSSC Notification is out. 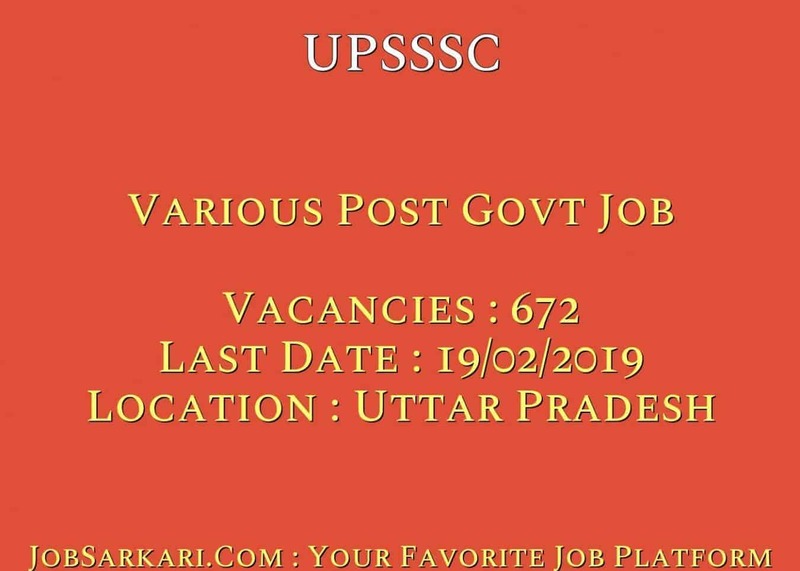 UPSSSC is recruiting for 672 Various Post Govt Job Posts. You can check UPSSSC - Uttar Pradesh Subordinate Service Selection Commission last date, download UPSSSC notification, visit UPSSSC official website and check other UPSSSC Vacancy details.Complete Vacancy and recruitment Details about 672 Various Post Govt Job vacancies in UPSSSC are provided below by JobSarkari.Com only for you. Last Date of Apply Online. 19/02/2019. Last Date of Receipt Application Fee. 19/02/2019. Last Date of Correction. 26/02/2019. Mode of Payment. Candidate Can Pay Application Fee Through Debit And Credit Card, Net Banking or E Challan. Assistant Consolidation Officer. Candidate Must Have Passed Graduation in Any Discipline. 69. 24. 00. 01. 94. Marketing Inspector. Candidate Must Have Passed Graduation And Having Knowledge of Devnagari Script. 99. 52. 40. 03. 194. Supply Inspector. Candidate Must Have Passed Graduation And Having Knowledge of Devnagari Script. 77. 41. 29. 04. 151. Assistant Guardian Inspector. Candidate Must Have Passed B.Sc in Agriculture or B.Sc in Bio Science Group. 37. 18. 32. 02. 89. Additional District Information Officer. Candidate Must Have Passed Graduation With Hindi As a Subject And Having Class 12th With English As a Subject. 11. 00. 00. 00. 11. Executive Officer. Candidate Must Have Passed Graduation And Having O Level Certificate in Computer From DOEACC or NIELIT. 46. 35. 22. 04. 107. Revenue Officer. Candidate Must Have Passed Graduation in Commerce And Economics. 09. 11. 05. 11. 26. Total Vacancy. 348. 181. 128. 15. 672. For Additional District Information Officer. 18 Years. 40 Years. For Other Posts. 21 Years. 40 Years. 7. Online Application Can be submitted On or Before 19th February 2019. Q. What is the Last Date For UPSSSC Various Post Govt Job Vacancy ? A. 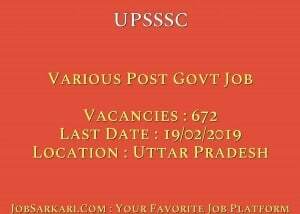 Last Date for UPSSSC Various Post Govt Job Posts is 19/02/2019. Q. What is the Form Type of UPSSSC Various Post Govt Job Recruitment ? A. The Form Type for UPSSSC Various Post Govt Job Posts is Online. Q. How many vacancies are available in Uttar Pradesh Subordinate Service Selection Commission Various Post Govt Job Posts ? A. There are about 672 Vacancies in Uttar Pradesh Subordinate Service Selection Commission Various Post Govt Job Posts. Q. What is the Full Form of UPSSSC ? A. Full Form of UPSSSC is Uttar Pradesh Subordinate Service Selection Commission .